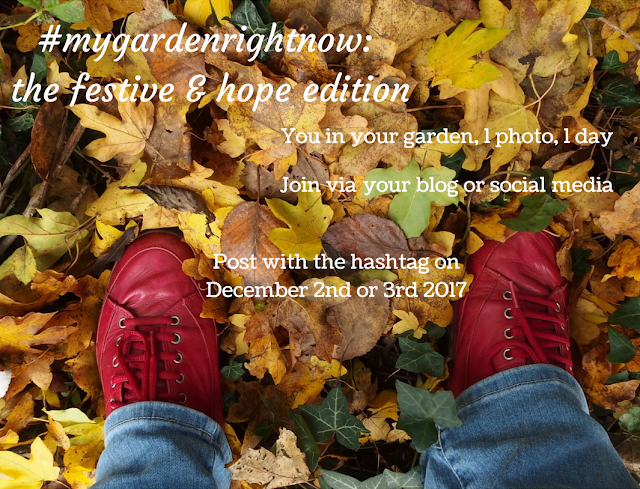 Our final #mygardenrightnow is a chance to show off the festive edition of your garden and to seek out any hope during the darkest time of the year. You may be surprised how much life you find! That's the beauty of this meme; it gives us a chance to go out and really look at at what we have out there. All you need to do is take one photo of yourself in the garden - more if you want - and post it on your blog or favourite social media. Don't worry if your garden is looking bare or a mess, we want to see real gardeners and gardens! Christmas decorations or green shoots pushing their way through the soil, plus any floral or winter structure you want to show off are especially welcome. Your favourite coffee cups/tea mugs and winter attire will be fun additions. The past few months I've been wandering all over Chippenham looking for its public art. According to Wikipedia there are just 7 pieces for me to photograph. I currently have 49 items on my spreadsheet and the war memorial on Wikipedia's list is excluded from the scope of my survey. It's a heartening quest as I thought there'd be just 15-20 items for me to discover, though as the sole Chippenham volunteer on Creative Wiltshire's project, progress is slower than I'd like. I'm also questioning exactly what counts as art; it's quite broad in the project's scope, so I've included transient items such as festivals, art exhibitions, graffiti and yarnbombing. ... you'll find Regal House is all wrapped up for Christmas. There were problems with the Piccadilly line, so sadly I didn't have time to fully explore Covent Garden's seasonal delights as I was late for my first appointment. Instead you'll have to imagine the dramatic notes of Nessun Dorma sung by a lady opera singer, and take the link to see the wonderful mistletoe lights decking the market halls. Confession time: I've yet to visit Hauser and Wirth despite living quite close to Somerset. Until that day, I have the next best thing: the garden's story as written by my friend Victoria and photographed in glorious detail by Hugo Rittson Thomas in their latest book, The Secret Gardeners. Here, we're very much in the world of the arts and the celebrity, a place quite removed from mine. They're notable and successful people with money no object kind of gardens... but what links these gardeners with me is we still have a shared love of gardening. We love our gardens, and we have a desire to make these spaces our own and the best they could possibly be. Stressful lives and the ways a garden or the act of gardening can heal are also explored. Again, this is something that resonates strongly. 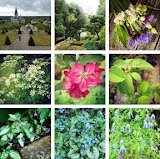 So, which of the 25 gardens featured have stayed with me? Following last year's Windowsill makeover, I'm pleased to report my basket of plants has filled out nicely and continues to look good in the kitchen one year on. The Aloe vera can be pressed into burns relief duties if needed, and the two Plectranthus on either side don't seem to mind being hacked back occasionally to keep them within bounds. ... fifteen months on from when Barbara gave me a cutting it has a few spikes of delicate white blooms. I thought they looked a little Salvia-like, so it's no surprise she says it's one of South Africa's indigenous sages, aka Plectranthus grandidentatus, aka vicks plant*. As well as looking sage-like, I also think the flowers are sticking their tongues out. Chippenham's Knit and Natter group have been at it again. 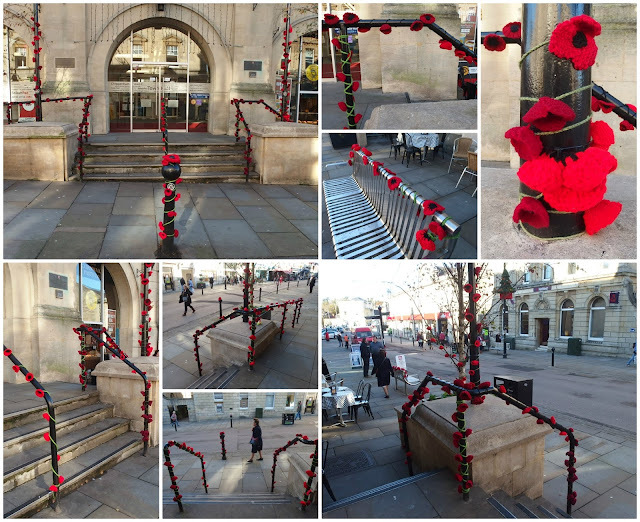 Like last year's Christmas display, their High Street poppies instantly became the talk of the town when they put them up on Monday night. Of course I had to photograph them for today's Remembrance Sunday, and I had several conversations with complete strangers doing the same. We all agreed how wonderful they are and a great help in our own Remembrance this year. Restoration of the town's war memorial is complete, with a local firm paying for the re-gilding of the soldiers' names inscribed on the monument. Later today, two women from my WI will lay a wreath on behalf of Chippenham's four WIs. As our group is the youngest of the four, it's our first time to take part in the town's official ceremony. Seeing it's November I decided it's time to pick the half-formed second crop fruit on the fig tree. It's a classic task for the month, when all the larger ones are picked (they won't survive our winter chills), leaving the smaller pea-sized ones to form next year's crop. Imagine my surprise when I found a ripened fig nestled beneath the last remaining foliage. It's pretty special because it's unusual to find edible second crop figs here in the UK. We don't usually have a long enough season of warmth, unlike those lucky trees in more southerly climes. My first crop was quick to ripen this year; 3 to 4 weeks earlier than usual, with me enjoying sun-warmed figs fresh from the garden on our return home on the 4th of July. Back then I'd secretly hoped I might just get a ripened second crop, even though Alan told me it wouldn't happen. I came across this quote recently when I was noodling around for yesterday's Muse Day, and decided that as it's Veg Plotting's 10th birthday, it's more appropriate for this post. It's a great reminder of what I've tried to do since that fateful day 10 years ago when I resigned from my job. It was Scary. Unknown. Dark. 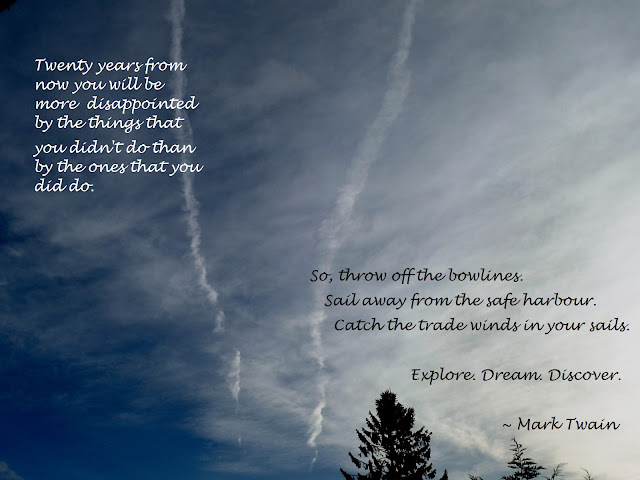 ~ ~ ~ Explore. Dream. Discover. That's a much better attitude to have. 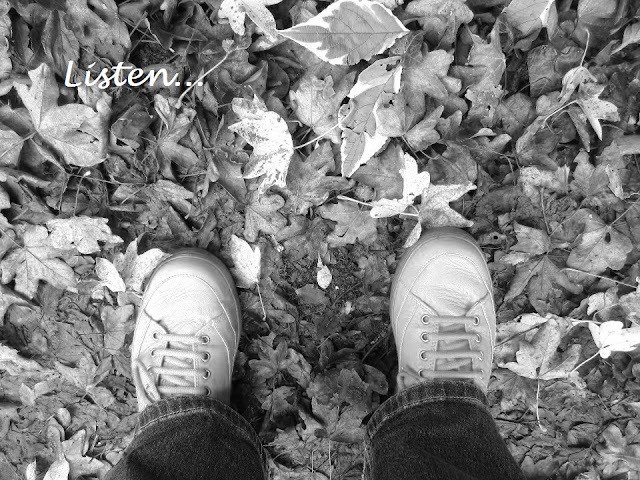 Colleen wrote a great piece earlier this week about gratitude. I love her posts; they're wonderfully observant, lyrical and comforting. She wrote about her gratitude journal, something I kept for a while many moons ago, which thanks to her I've opened again. Adelaide Crapsey was influenced by Japanese poetry, particularly haiku and tanka, to produce her own form of the cinquain or quintet. This is the form of poetry she is most noted for, where she distributed 22 syllables (aka accents) across the 5 lines. 2 are in the first line; followed by 4, 6, 8 and a final 2 in the last line. Which reminds me. A long time ago at the almost dawn of blogging there was a fine blog, where a merry band of people contributed posts on all things biscuitry. I was even moved to write a biscuit haiku about an empty tin. Happy days. If the embedded video doesn't work, try this link instead.